Coverage of the Homeland Security funding flap focuses on allegations of intent to give GOP incumbents in tight races some pork to brag about. There's a more subtle, and to me troubling, interpretation that seems sneakily Rovian. Perhaps the real intent was to cause coastal elites to go berserk, thereby confirming to heartlanders our overwrought sense of entitlement. In other words, to energize the base, not by gratitude but by the much more effective means of resentment. If so, it seems to be working. Someone was reading choice bits from the tabs on NY1 this morning, and I heard something about ear-to-ear grins in "Podunk America"; and, of course, New York State Comptroller Alan Hevesi's howler, in front of a college graduating class, no less, about Chuck Schumer wanting to put a bullet in an unfortunate place, couldn't have been scripted better by Ol' Karl himself. An aging beauty comes to town. Last September, I posted about ship watching from the Brooklyn Heights Promenade, and concluded my essay with a photo of a very pretty and shipshape vessel heading up the Hudson towards the midtown cruise ship terminal. You can find it here. 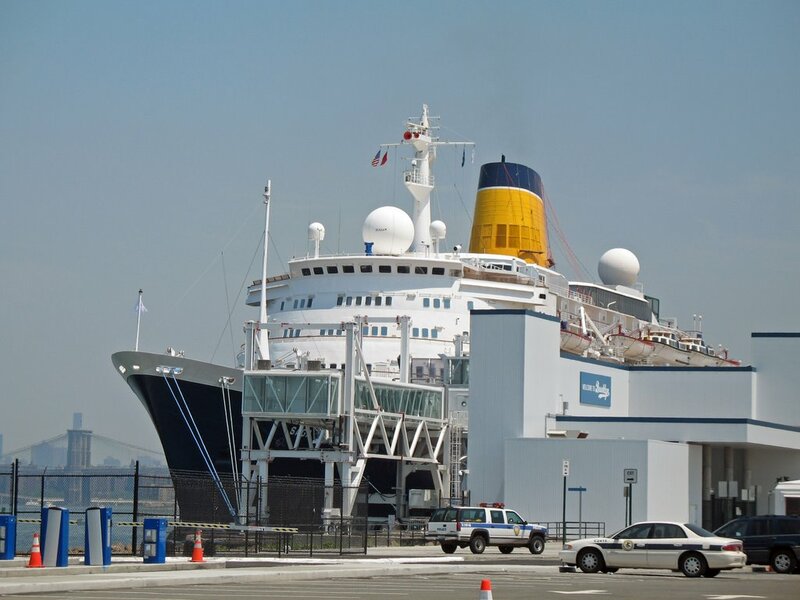 On Sunday, while crossing the Brooklyn Bridge in a cab, I was delighted to see that same ship docked at the Brooklyn cruise terminal. Monday being a holiday, I was free to take my camera to Red Ho ok to get a closer shot of her, and to try to ascertain her identity. Here she is, looking fine, despite the addition of two unsightly domes that, no doubt, protect electronic devices of considerable value in enhancing the safety of her passengers and crew. Note the Brooklyn Bridge in the distance. The gantry next to her bow obscured her name, though I could make out that it started with an "S". When I got home, it took a few minutes on Google to identify her as Saga Ruby, of Saga Holidays, U.K. She began her career as Vistafjord, of Norwegian-American Lines, having been completed in 1973 (her classic lines fooled me in my earlier post into thinking she was ten of fifteen years older) at the great Wallsend shipyard of Swan Hunter. In her early years at NAL, she may have been among the last ships to maintain a transatlantic liner service, at least during the summer months. She was later acquired by Cunard, which operated her under her original name for several years before renaming her Caronia, after an earlier ship that had the distinction of being the first Cunarder to be purpose-built for cruising. During my first months in New York, in the summer of 1970, I spent many hours studying for the bar exam on the Morton Street Pier, which extends into the Hudson from Greenwich Village. When I looked to the south, I could see the older Caronia (actually the second Cunarder to bear that name) anchored in Upper New York Bay just a couple of miles away. She had left Cunard ownership some time before, and instead of having her original sea-green hull with white superstructure and Cunard's red and black funnel, she was a solid dull white with blue funnel. After a month or so of riding at anchor, she was towed up the Hudson to an unoccupied pier and docked; when her bankrupt owners couldn't pay the fee to keep her there, she suffered the ignominy of being given a parking ticket. In 1974, she was stripped of her fittings, some of which later became decorations at a bar near the Village apartment where I lived in the late '70's. She was then sold to Taiwanese breakers, but ended her days enroute to the blowtorch when she struck a seawall off Guam and broke up in heavy weather. Saga Ruby, along with her near sister Saga Rose (formerly Sagafjord), has the distinction of being one of the last of the survivors of the liner era still in service. Long may she sail!